The 3DEXPERIENCE platform is a BUSINESS EXPERIENCE platform. It provides software solutions for every organization in your company from engineering to marketing to sales — that help you in your value creation process to create differentiating consumer experiences. With a single, easy-to-use interface, it powers INDUSTRY SOLUTION EXPERIENCES — based on 3D design, analysis, simulation, and intelligence software in a collaborative, interactive environment. It is available on premise and in public or private cloud. Innovation increasingly means global teams collaborating with global information in a social context – and doing so with clarity, confidence and consistency. Powered by the 3DEXPERIENCE platform, ENOVIA enables you to plan your definition of success. With a broad portfolio of technical and business applications, ENOVIA enables stakeholders across the enterprise to contribute to sustainable innovation. Dassault Systèmes SIMULIA applications enable users to leverage multiphysics simulation and high-performance computing (HPC) to explore and optimize real-world behavior of product, nature and life. 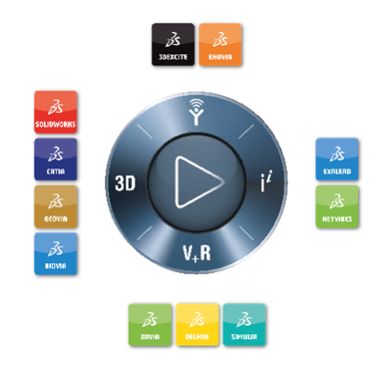 As an integral part of the Dassault Systèmes 3DEXPERIENCE platform, SIMULIA applications accelerate the process of evaluating the performance, reliability, and safety of materials and products before committing to physical prototypes.